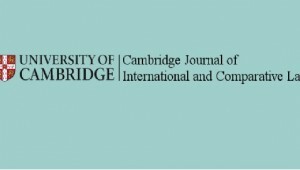 The editors of the Cambridge Journal of International and Comparative Law (CJICL) welcome submissions for the journal’s 5th Annual Conference, Public and Private Power, April 8-9, 2016. Abstracts are due by Jan. 10, 2016. See CJICL Conference 2016 – Call for Papers. The theme for the CJICL 5th Annual Conference is “Public and Private Power”. We are interested in doctrinal, theoretical, institutional and comparative perspectives from international, European and comparative law on the regulation of public and private power.